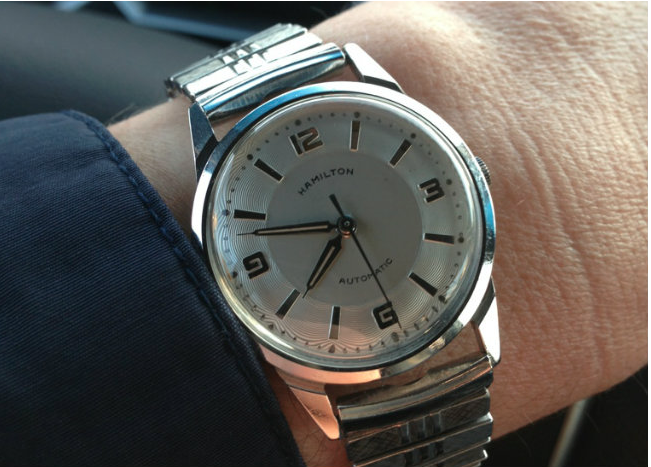 I recently picked up a Hamilton automatic watch that was not working. I took a chance on hopefully it just needed to be cleaned. 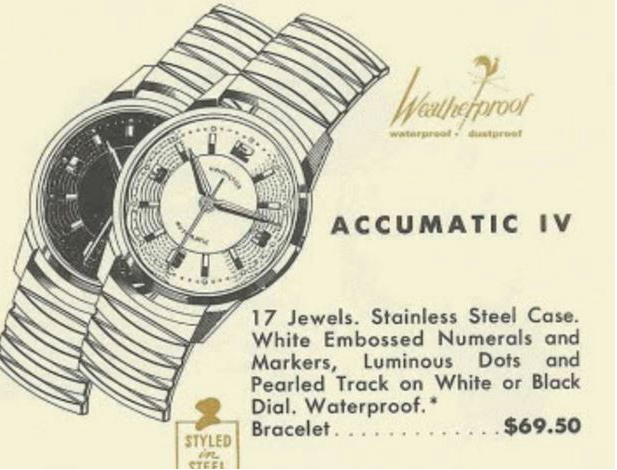 Looking it up in the catalogs, I discovered that it is a 1958 Accumatic IV. It was produced for four years, including a IV-B in 1961. 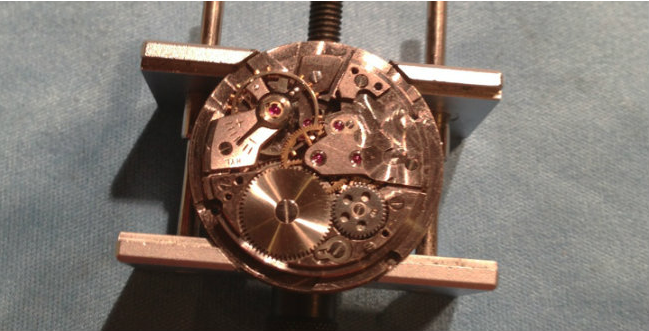 The last year may have a slightly different case design to accommodate a different movement. 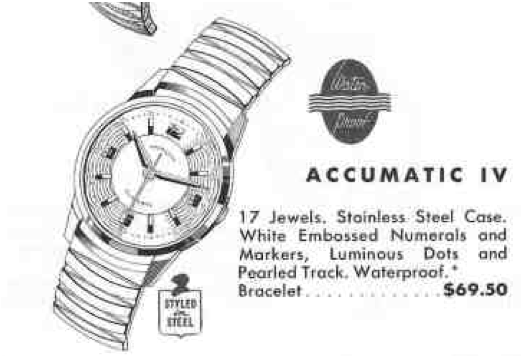 The black and white drawing in the catalog ad does not do the true coolness of this watch justice. The central part of the dial is flat and the outer circumference has a wavy, textured pattern surrounding the embossed (stamped) numerals and markers. It's all surrounded by a durable stainless steel case. In 1959 a black-dialed version of the watch was also offered. As received, my watch was perpetually stuck at 9:11, on the nose. The crystal was terribly scratched and I removed it in order to measure it so I could order a replacement. 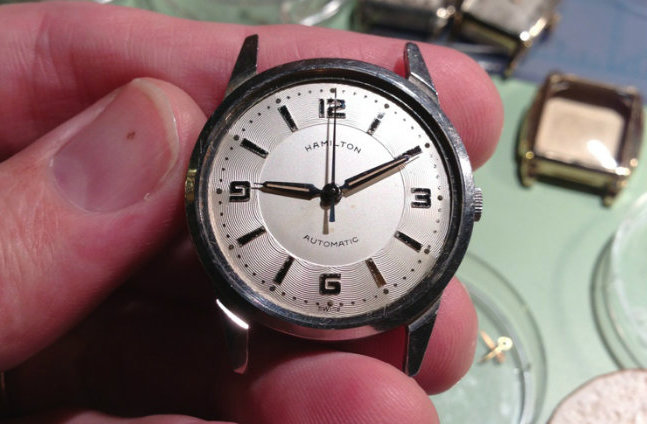 With the crystal removed you can see that the dial and hands were actually in nice shape. I was happy to see the watch has a screw-off back. Sometimes years and years of "old man funk" makes it hard to remove the back and this one shows some scratches from a prior owner trying to break it loose. Still, I prefer a screw off back to opening through the crystal - as the two piece stems needed for crystal-access watches can be a pain to fuss with. 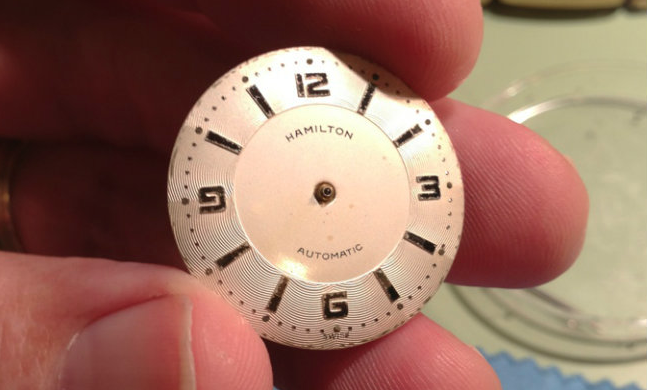 With the movement out of the case and the hands removed, the dial can be taken off and cleaned up a little bit. This one has some minor spots on the flat center section. 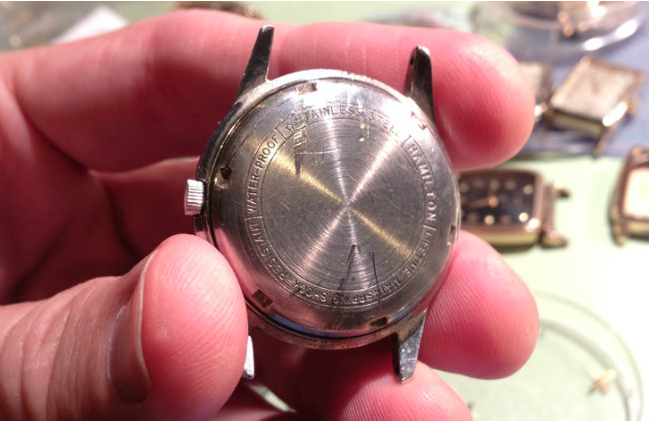 The movement is a 17 jewel Hamilton 672 Swiss-made grade. Here you can see the big rotor that spins around while the watch is worn and will continuously wind the watch through a series of gears connected to the ratchet wheel. Three screws hold the rotor assembly onto the movement and once they're removed the rotor and it's gears just pop right off. That leaves what is essentially a mechanical movement left to tackle. At this point it's just like any other overhaul. 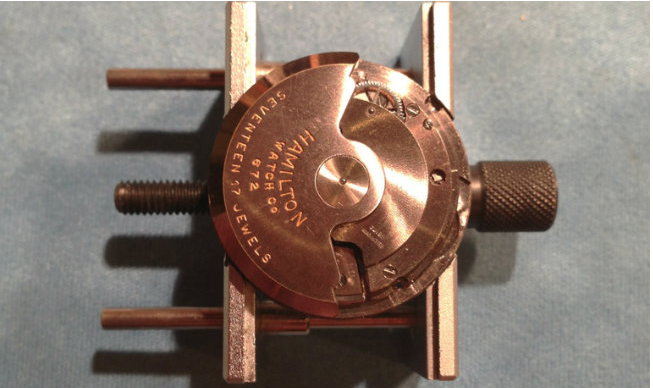 The mainspring tension is let off, then all the parts are taken off one at a time. Everything gets cleaned, dried and then reassembled with fresh oil on all the bearing surfaces. I was happy to see the watch spring back to life when I reinstalled the balance assembly. I was right in thinking all this watch needed was a thorough cleaning and a new crystal. Here it is all reassembled and ready for some wrist time. The curvature of the crystal really highlights the texture of the dial and almost gives it a pie-pan effect. nice....i have one same movement... Gold filled black dial..with a concentric cut circle effect that puts on a real show, gold hands and spots and numbers...keeps fantastic time. I have a Delaware Watch company 42 Jewel Colonial Sea Nymph. Thanks for another great article. I recently bought an old 672 and was wondering if you could share how the dial is removed. I can only see 3 screws on the side that may secure it but thought I'd ask since you're familiar with the movement. Thanks! There are two screws on the side of the main plate. You loosen them and the dial will come off. You are all spot on this watch is absolutely gorgeous. I have the same exact one ..